Today's Sunday Oregonian issue has an article in it on page A13 where I don't know whether to laugh or to cry. "U.S., Israel can't agree on diplomacy" makes me scream out, "What's the matter with you, John Kerry! Why haven't you learned anything about Israel and its problems that they need to defend in order to exist in this world?" There is evidence from this article that he doesn't get it at all, and here he is, in charge of Israel's dealings with the world, and he's anti-Israel. I'm not the only one up in arms about today's dealings. Diplomatic correspondent, Chemi Shalev of Haaretz newspaper in Israel wrote on their website that if you compare weather with Israel and the USA right now, this is a "superstorm" of relations. We're talking about an issue that has been critical to Israel for a long long time concerning their very existence. 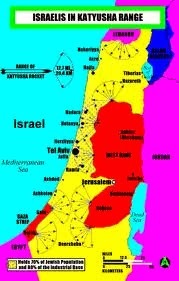 Map showing the range of Katusha rockets that can rain down on Israel. Note red area of Gaza along seacoast continues to rain down rockets, mortars and missiles despite cease-fire. Kerry was said to question in a broadcasted interview Israel's seriousness about peace with the Palestinians. How dare he even think that - is my gut reaction. Kerry has no idea of what is going on with the goals of the neighbors of Israel and what Israel is up against in dealings. It's a poker game of the extreme, played by master chessmen who plot and scheme from beginning of the game to checkmate, and Kerry is simply a checker player. The thing Netanyahu and the rest of Israel want most in this world is peace, but they have already lost 80% of what was originally promised to them in the Balfour Doctrine through dealings with Britain where they were really cheated out of land including far more than just Judea and Samaria-that and the whole state of what is today, Jordan. That had originally been promised and planned by the nations of the world to be the Jewish Homeland. Hoodwinked by the act of taking it outright, Israel lost it to Abdullah who created Transjordan, then later named it Jordan. There went 80%. Now Israel had gained back Judea and Samaria after being at war-attacked first by all the neighboring states - and winning. Yes, winning the land back after much bloodshed. So now we have John Kerry who insists we have no rights and are to give it back, meaning that all our people have to move out in order for it to be Judenrein like in the Nazi era? We've already moved out of Gaza for the sake of peace, lock, stock and barrel in the name of peace, and did this lead to peace? Did any country carry or give a ...about it or help Israel in her hour of need? No. We've been under attack since 2001. It hasn't let up. Threats have been coming from Iran to completely destroy Israel. The steps Islamic countries usually take is to warn first, then attack. Israel has been warned and now she's watching the progress of the death machine they plot to use. They are heading for atomic energy where they will have the capability to make atomic weapons. Saudi Arabia even feels threatened and that's because they are Sunnis and not Shi'a. The USA is taking this lightly, as if it is a joke. Israel happens to be the only Jewish state in the world, a state as big as New Jersey which is one of the smallest in the USA. It's like being Washington DC and the 50 states are all out to destroy their capital. This article brings out the uncomfortable relationship between Obama and Netanyahu that both had tried to keep in abeyance. The world knows that Netanyahu has vowed to do anything, including a military strike, to prevent Iran from reaching the point of being able to produce atomic weapons, for they know such a thing would be used on Israel. I remember well the lecture Netanyahu gave to seemingly simple-minded Obama on TV after Obama was all for Israel to go back to the 67 lines, and Netanyahu was so shocked that he blurted out all the reasons why that was impossible for Israel's security. Really, it showed up Obama's ignorance of the land and previous wars that Israel has had to fight. How about the time Netanyahu was at the White House for a meeting with his staff and they were ushered in through the back door, and were not invited for dinner but kept in a room to keep coming up with ideas. That burned me up! How many statesmen have been treated like that? Obama was showing his feelings, not his diplomacy that time, and he was being crude and rude..
Josef Federman says it correctly in this AP piece that there is a lack of chemistry coming from vastly different world views. That's the problem. Why aren't the people working with Israel studying their world? I'm not really sure what Obama stands for, but Netanyahu believes that Israel can't trust any promises from other countries, having been burned so many times already, and must protect itself. He's been under the delusion that he could trust Obama like Israel has of other past presidents. He thought that they were on the same page, but dealings have showed they are not. Why can't the USA understand what has been happening? Israel gives in and gives in; land for peace after being attacked, and their enemies are never asked to give a thing. This is happening right now. Israel won a bloody battle in 1967 and again in 1973 and again in 1982 and again and again and yet they are the ones to give in? Give land up that is so small? Follow this rule and Israel will be a mile square island in a sea of sharks and will then be gobbled up. Even in the Middle East in a shuk, there is give and take until an agreement is made. You don't cave in immediately. That's what Kerry is doing. Let's get this over with and the Palestinians are such good people, that Israel has to go along with whatever outlandish demands they make? Israel has already let out monstrous criminals that they have demanded and that only has whet their appetite to make more demands. The Palestinians have stuck their big toe into the water and found it was warm. Now they're jumping into the pool. There is no barrier to their demands on Israel, and Iran has received the same treatment. They have been given the green light as well. My, Kerry is really a hard negotiator. He's really earning his money. Just say yes to everything to the enemies of Israel, and then blame Israel. Ever since Harry S. Truman backed Israel's right to exist and to come into this world, the USA has been of the same mind. Up till now, Israel has been the USA's friend in the Middle East when others haven't, and vice versa. Our very leadership today is not made of the same mettle. Federman wrote that Obama is a proponent of diplomacy and consensus. Well, he hasn't been very diplomatic with Israel unless the cameras are on him. As to consensus, he's made a lot of decisions without our Senators' approval. Either he makes decisions on his own or waits too long and then all is swept under the rug, like Syria or Benghazi. Barack Obama's approval rate from Jan 20, 2000 to now has sunk to 49%. His high was 69% from Jan uary 22-24, 2009 and low was 38%. October 15-17, 2011. With ObamaCare's results right now it should reflect an even lower score. This change, something he brought into his office, is bombing. He warned and ran on change, and he certainly has changed all our ways and means including our bank accounts. Where Israel was a friend, Kerry just unfriended her. No, Israel should not go along with these one-sided demands. There's nothing in it to protect Israel from another battle breaking out. http://jewishfactsfromportland.blogspot.com/2013/04/kerrys-reviving-2002-peace-plan.html All Kerry came up with is going back to the 67 lines.